Having children teaches you a lot about money. Or, as is often the case, your lack of it – as I’m sure many parents would agree. But fortunately, since becoming a parent almost eight years ago, I’ve learned a valuable lesson about how long-term saving and investment works. Just over a decade ago the government introduced the Child Trust Fund. This tax-efficient savings scheme also paid parents a £250 initial bonus. Although the Child Trust Fund (CTF) was brought in in 2005, it covered children who had been born as early as 1 September 2002. The aim of the scheme was to encourage parents to build upon their initial £250 and generate a nest-egg that would help their son or daughter cover the cost of university tuition fees, for example. Or take their first steps on the property ladder after they turned 18. CTFs were phased out by the coalition government that took power in 2010 and were replaced by Junior ISAs the following year. These offered the same tax benefits without the initial bonus payment. By a matter of weeks, my son managed to qualify for the £250 bonus, so our family had every incentive to take his Child Trust Fund seriously. As well as thinking about how it would be invested – in shares or cash, or a mixture of the two – we also had to decide how much money we’d be able to set aside each month to build the fund up. After all, while the £250 initial payment was very welcome, we knew it wouldn’t be much use on its own. From the start, and with some help from my son’s grandparents, we have managed to put £100 a month aside for his future. Of course, not everyone will be able to afford this much, and others will find it easier to put two or three times that amount aside. But the important bit is making it a habit. By setting up a standing order to your child’s CTF or Junior ISA, the money comes out of your account automatically, along with your mortgage and utility bills, each month. And with a bit of luck you will barely notice it has gone. There are still more than 10 years until my son will become eligible to withdraw the money in his fund. 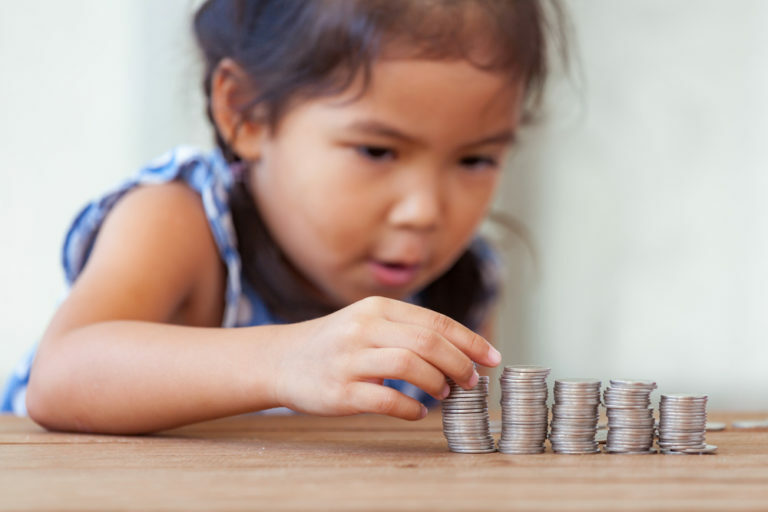 But even at this relatively early stage, the impact of saving a regular sum from a young age is apparent. Thanks also to the returns that have been generated by the stock market over the past few years, especially when compared to cash, my son is well on his way to a fund that will be able to substantially soften the blow of paying for university, for example, or finding a deposit on a first home. Investing in stocks and shares may be a higher risk, however it offers the potential for better returns. This is especially true over a longer period of time, such as with the life of a Junior ISA or Child Trust Fund. But remember that past performance is not a guarantee of future performance. Due to market fluctuations the value of your investment may go down as well as up. It’s vital to force yourself to start saving as soon as your child is born. If you don’t do it there and then, there’s a chance you won’t get round to it for a year or two – or even longer. Compound growth is a real thing: the earlier you start, the more its effects are amplified. Set up a standing order to pay into your child’s account as much as you can realistically and comfortably afford. If you rely on contributing manually every month, you’re bound to miss some payments every now and again. Remember you’re saving for the long-term – around 18 years at least. Putting your money into shares or investment funds may be more risky than cash, but the potential returns are considerably higher. Just be aware that your investment may go down as well as up. Enlist grandparents’ help. Ask if they can contribute every month as well, even if it is in lieu of birthday or Christmas presents. Your kids will thank you for it, eventually. Teach your children how to handle money. Over the next few years a new generation of youngsters are going to get access to thousands of pounds, in many cases, the moment they turn 18. At that moment it’s legally their money to do with as they wish. It is vitally important that they are financially literate when this happens. Note: Whilst we take care to ensure Talking Finance content is accurate at the time of publication, individual circumstances can differ so please don’t rely on it when making financial decision. The opinions expressed within this blog are those of the author and not necessarily of OneFamily.